A pair of these cutters will literally last a lifetime. Day in and day out they can be used to cut the plastic laminate pieces with and they will remain sharp. You can make circular cuts or fit Formica to walls or other cabinet parts that are not straight. CAUTION: These scissors are not intended to be used for cutting large pieces of plastic laminate for cabinets or countertops. It’s best to cut entire sheets with a table saw or a router and a straight edge. Really, the only drawback to using tin snips is that the right side of the cut is always rough and the left side of the cut is clean. For some reason there are always small chips that occur on the right side which make that edge unusable. The hand shears that are designed for cutting Formica will not cut circular or crooked patterns very well. They are designed to make straight cuts only. The reason they don’t cut odd shapes very well is because the blades are too fat. They actually remove a full one eight of an inch from the plastic as the cuts are being made. They are not readily available as the tin snips found in home centers. In other words, you will have to special order them and wait to get them shipped to you. 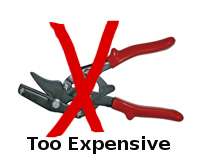 They are expensive laminate shears. The last time I looked the cost was over twenty seven dollars for a pair. The will cut the Formica clean on the left and right side of the cut. When cutting Formica plastic laminate with a hand tool, not a power router, you will need to handle toe material with great care. If by chance you bend the Formica too much while cutting with the tin snips or laminate shears, you could rip the sheet beyond repair. Always work slowly when cutting Formica and make sure that your material is well supported on a table or even the floor. If you will be making large pieces from a sheet, it is best to use a router in combination with a straight edge or a table saw. Cutting Formica with hand snips, scissors or shears should always be done with an attitude of patience. Be sure to practice your cuts before you actually make the real ones.